You know the old expression, pick your poison? 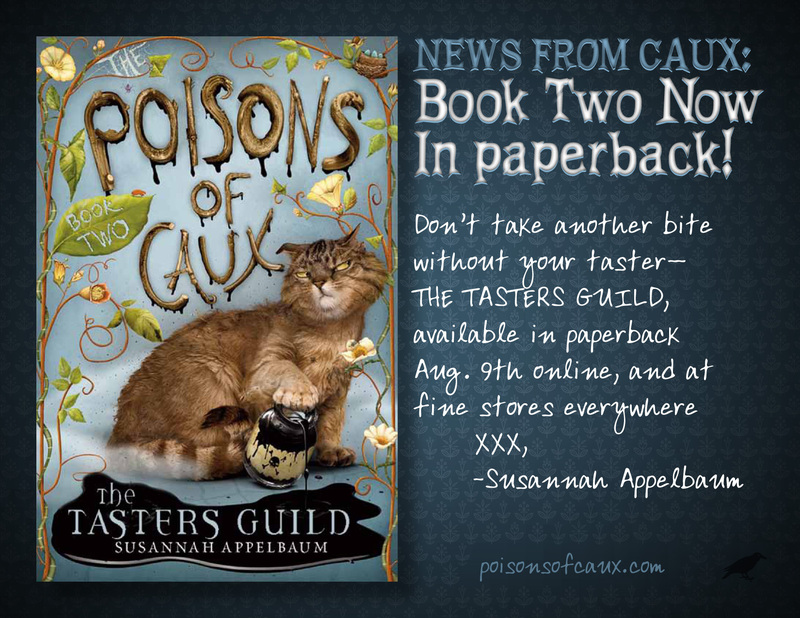 Well, in addition to our two cups of java a day, we pick The Poisons of Caux: The Tasters Guild by local author Susannah Appelbaum, the paperback edition of which hits books stores today! The second installment of The Poisons of Caux trilogy continues 11-year-old Poison Ivy’s quest to fulfill her role as the prophesied “Noble Child” and rescue good King Verdigris from a deathly illness. In the first book, The Hollow Bettle (Knopf, 2009), Ivy defeated the evil King Nightshade, good King Verdigris’s usurper, an evil man with a taste for poisoning the oppressed masses. Those with money in the land of Caux are forced to hire Tasters, lest their next bite of food be their last. Book Two finds Ivy, along with her friend Rowan, an outcast Guild-trained Taster, racing to save King Verdigris while avoiding those in power who seek to destroy her. When Ivy’s exposed to a deadly weed that transports its victims to a dark realm, she’s not sure if she’s strong enough to battle her way back. The wonderfully inventive world of Caux is full of of strange and mysterious characters living in a magical world where good and evil, beauty and decay battle for the soul of Caux. Although the books are written for young adults, this is one of those series that appeals to both kids and adults. The depth of the story and the literary artistry will hook you no matter your age. We are excited to announce that Susannah will be coming to HCT early in the fall for a book signing. Stay tuned for more details!